Cheap thrills for my wife and I are the common animal sightings here in the mountains. White tail deer are probably the most common, sighted both day and night. Other common sightings are of armadillos, opossums, rabbits, pileated woodpeckers, owls, blue herons, and coyotes. We discuss our sightings jealously over dinner like excited children. Having been city dwellers most of our lives, living in the mountains the last eight years has been a sighting delight for us. Last Saturday, close the full moon, I sighted a gray fox by our road near our house. He had tripped our outdoor motion light and stood there staring quite regally. I was bolting our front door before bedtime or I would have attempted to get a picture. My interest piqued, I went about my usual quest for information when I encounter something I am not satisfied with my personal knowledge of. Aside from the common information available on foxes in general, I noticed an interesting tidbit I wanted to share. 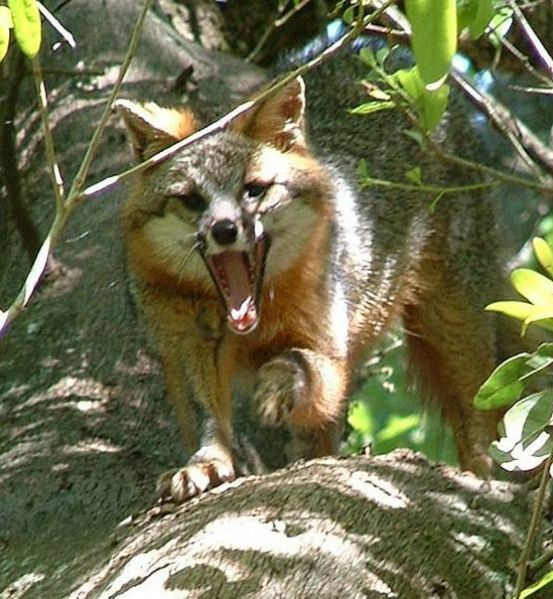 Gray foxes are one of only two canine species that can climb trees. Apparently gray foxes have hooked claws that allow them to scurry up trees to get away from natural predators. They also climb to find food. They either back down like a house cat, or simply jump from one lower branch to another to exit the tree. It is noted that they are crepuscular or nocturnal. This would explain why I saw mister fox out late using the available moonlight as his guide. Like you, I’m always curious when I see an unexpected animal, or an animal doing something unusual – though I don’t have a lot of animal knowledge. We have lots of foxes here in Hove. Some live in a couple of back gardens which have been left quite wild. I often see them on the sea front. I presume they come down to go through the rubbish bins outside the cafe, restaurant and fish monger.